Artificial Grass Pros had a record breaking summer this year. Our team did several large artificial grass commercial installations. In addition, we did a few residential projects too. of course, we thought you would like to see what we were up too all summer. Plus, it's a great opportunity for us to showcase our products. And we also get to talk about the advantages artificial grass offers over traditional lawns. Also, we work with many commercial developers, HOAs, event production companies and municipalities. Look at the following installs. They show how artificial grass can improve the look and feel of any green space. If you have a project coming up, consider Artificial Grass Pros. We can help. This is why schools love us so much. They get safe, maintenance free play spaces, not to mention, the return on investment! Speaking of schools, here is another one of our large artificial grass commercial installations below. It was huge! There are more too. We just listed a few common ones. Artificial grass commercial installations have so many benefits. Think of how much money Stratford School saves now by eliminating a major portion of lawn maintenance from their landscaping budget. Seems like they are saving a bundle since riding lawn mowers are now a thing of the past for them. Also, they save staff dollars because they don't have to pay someone to use the equipment. This makes use of staff dollars more efficient. Of course, parents of private school parents have to love that. Knowing a school makes good use of your tuition money puts your mind at ease. No wonder Stratford is so successful. They expanded from a four classroom startup up in 1999 to 23 campuses today serving thousands of students across California. We were privileged to remodel their campus with 14,144 square feet of artificial grass. And we loved every minute of it too! We excel at large artificial grass installations. It's why we are contracted every year for the Dreamforce conventions put on by Salesforce.com. In addition, we did the Google athletic soccer field install, another massive undertaking. All of that to say, if you need artificial grass for your commercial project, we can help. Contact us today. 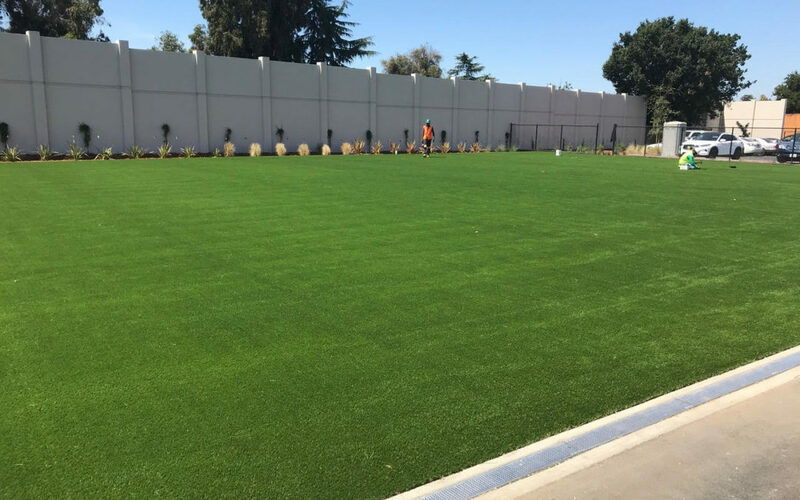 We are the Bay area's go to for large artificial grass commercial installations. We can even help with design and specifics if need be. Our staff our knowledgeable and we have some of the best installers in the Bay area. Yet, we also performs residential installs too. Look at the following two examples As we stated earlier, it's been a record breaking summer for Artificial Grass Pros. We have the installs and photo evidence to prove it! This 512 square foot install features NewGrass Premium Natural. Our client is happy with the results and we are too. Now they can enjoy a much lower water bill along with their evergreen yard! This is good news for California residents. Seems like our water bills always go up, even in drought conditions. And speaking of those, it feels like we are always under some sort of drought restriction. In fact, governor Jerry Brown instituted permanent municipal watering restrictions in certain locations in an effort to conserve water. of course, we all want to do our part for water conservation. That's just a way of life in California. To that end, artificial grass is a great way to make an impact. It's a true eco-conscious choice with major pocket book benefits. Remember, the average artificial grass install pays for itself within 5-6 years. After that, your lawn pays you. This is why you see it widely used in both commercial artificial grass installations and residential projects. Artificial grass lawns have real value with real benefits and real returns. No wonder our Fremont client loved it so much! Yet, they weren't the only one. We have one more residential install to show you with a different grass product. Our client in Benica needed a lawn makeover. They decided to go with artificial grass and reached out to us. Our response was 675 square feet of NewGrass Premium Fine. The blades on this product work together to provide a thick, plush carpet like setting. Augusta, Georgia would drool for this type of fairway grass. However, for our client, it is a reality. Now they can enjoy a permanent lush green space for outdoor entertaining and have a nice space for kids to play in as well. Ultimately, artificial grass is about creating the perfect space to suit your needs. Consequently, if you need help, contact us. As we said earlier, our staff are some of the most knowledgeable in the industry. From sales to installation we will work with you to come up with the perfect solution for your lawn. We had a record breaking summer for sure, but we don't rest on our laurels around here. Up next is a record breaking fall. Of course, it would be amazing to have your install in the lineup. So contact us today and see why so many customers go Artificial Grass Pros! We look forward to hearing from you!